This is particularly important when it comes to trying a Champagne like Leclerc Briant's Abyss, which has been aged for 15 months underwater at a depth of 60 metres. The bottle has no label, as it would have come off in the sea; instead, it has a tag attached to the muselet, the wire that keeps the cork in place. It gives the date of harvest, disgorgement and even the GPS co-ordinates for the exact location where it was aged in the sea, which was in the Bay of Stiff on the eastern tip of the Île d'Ouessant, off the coast of Brittany. Leclerc Briant was one of the first Champagne houses to farm biodynamically (which is organic, guided by the lunar cycle) and immersing the Abyss Champagne in the sea is akin to placing it in a giant dynamiser. The result is truly special, with a rich complexity of dried apricot, apple, brioche and nut flavours, with a ghost of salinity on the finish. It is one of a range of unique Champagnes from Leclerc Briant, and I've featured a slightly more affordable one in the line-up today. How long a Champagne is aged contributes hugely to its unique flavours. During its second fermentation, which is used to create the bubbles, it can be left on the lees for a long time, which keeps it relatively fresh as it ages. Some Champagne houses, like Bollinger, hold back a number of select bottles for extended ageing and disgorge them, removing the sediment in the bottle, when they are ready to release. This is done by a process called 'riddling', where the bottle is gradually rotated and tilted until the neck points down. This is then frozen, and when the cap is removed, the plug of frozen sediment pops out. The date of disgorgement is very important because an aged bottle will taste very different a few months after disgorgement compared to two years after. 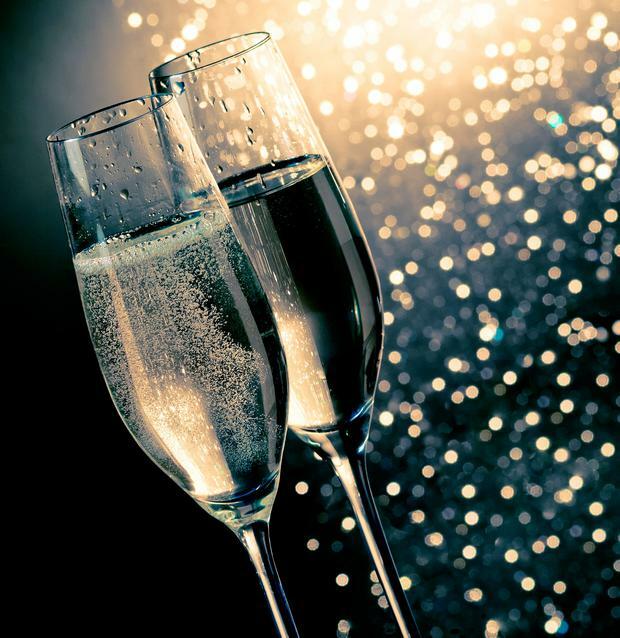 Another factor that influences the taste of Champagne is the grape varietal, and just three are permitted - Chardonnay, Pinot Noir and Pinot Meunier. Even though the last two are, in fact, red grapes, they have no contact with the skins in the winemaking process, so the juice is white. They can be used as a blend or as a single varietal, and if you have ever seen 'Blanc de Blancs' on a label, it means that the Champagne is made from 100pc Chardonnay. One of the most famous is Salon 'S', which was created in the early 1900s, using grapes from a single Grand Cru vineyard, Le Mesnil-sur-Oger, with the wines cellared in the bottle for an average of 10 years. Charles Heidsieck (not to be confused with Piper Heidsieck) also makes an exquisite Blanc de Blancs. So, is it time to throw all your flute glasses away? Certainly not. They are perfect for the more inexpensive bottles of Champagne, Cava and Prosecco you can pick up in the major supermarkets. If you have a reason to celebrate coming up, I have four really exceptional Champagnes (see panel, right) for you to try, and even if you don't have a special occasion, why not crack out the wine glasses and fill them with a more affordable Champagne, like Aldi's consistently good Veuve Monsigny or Lidl's Comte de Brismand, both €19.99? Santé! Perrier-Jouët - the beautiful summery Champagne with the Art Deco bottle - is featuring on an exclusive Belle Époque Summer Tasting Menu at Wilde Restaurant in the Westbury Hotel in Dublin this month. The Terrace at Wilde's has been transformed with a beautiful installation of anemone flowers. On the menu, the starter of scallops is matched with Perrier-Jouët Grand Brut; the main course of Dover sole with homemade crispy gnocchi and asparagus is paired with Perrier-Jouët Belle Époque 2008, and an indulgent strawberry and basil leaf panna cotta is served with Perrier-Jouët Blason Rosé, just the perfect summer match. See wilde.ie. It's worth seeking out Delamotte, the more affordable sister Champagne of Salon. Made from a blend of 55pc Chardonnay, 35pc Pinot Noir and 10pc Pinot Meunier, it has a perfumed nose with crunchy apple, taut lemon and a savoury, toasty quality on the palate. Not aged underwater, but very fine quality, this reserve Champagne has a floral nose, with notes of verbena and honeysuckle, and is fresh on the palate with crunchy red apple, citrus flavours of lemon and lime, a well-integrated toasty character and a stream of very fine bubbles. With a perfumed nose and a touch of spice, 75pc of the Chardonnay grapes in this elegant Champagne come from the 2012 vintage. It is aged for four years on the lees for a rich, toasted almond creaminess, with crisp citrus flavours. The 'RD' stands for 'recently disgorged' and this rare vintage Champagne has been held back for an extended time, resting on its side and ageing on its lees. Disgorged after 13 years, it has rich flavours of brioche, roasted apple, nuts and a hint of orange peel.